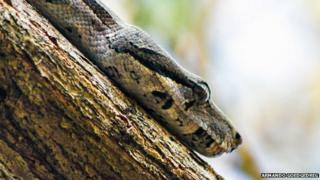 For a long time no-one could understand how Aruba's boa constrictors spread across the island so quickly. Then they realised - the snakes could easily travel miles by hiding under car bonnets and hitching a lift. This might be the Caribbean of tourist dreams, but from where I'm standing, there's not a rum punch or sun lounger in sight. Cacti, dense, sable brown scrub, immense boulders and the odd skittish goat surround me, in this arid landscape that looks like something more akin to Australia's Northern Territory. The fact that snakes - boa constrictors to be precise - are, according to my guide Robert, absolutely everywhere here in the Arikok National Park in Aruba, only compounds the sense that this is no relaxing beach break in paradise. In fact I'm on a wild island, with an invasive species far more deadly than the slew of cruise ship passengers meandering around the myriad duty-free stores in the capital Oranjestad. "Somebody, back in the 90s, had some boas as pets," Robert tells me as we continue to walk through the park, the insistent Caribbean sun casting a piercing heat upon us. "They probably couldn't afford to feed them - fully grown boas need live chickens and things like that. So this person just released them. And they seem to just love Aruba - they're thriving here." With boas giving birth to live young - some 30 to 50 babies a year - it didn't take long for the snakes to multiply at a dizzying rate, with devastating effects for the birdlife on the island. "We give US$10 to anyone who can bring us a boa that's still alive," I'm told. "Then we give them to the government and they destroy them. You don't get any money for a dead snake though. "We couldn't believe how many snakes were being brought to us the first time we had a hunt day. One guy came in with a sack full of about 30 snakes - all were still alive. It's difficult for me as I walk this park every day. I'm really scared of them. I'm glad its not long until I can retire." Later that day, despite not having seen any snakes during my walk with Robert, I decided to indulge in a more conventional Aruban tourist pursuit, namely taking a boat ride out to snorkel among the parrotfish and other tropical curiosities that swarm, dart and glide around the warm waters off the Aruban coastline. But even here, it didn't take long for the subject to return to the boa problem. Anthony, my skipper, with whom I was sailing on his bright red vessel named the Tranquilo, rummaged for his phone when I mentioned the walk in Arikok I'd had that morning. "You have to see this film," he told me. And so, shielding the screen from the sun, I watched a shakily-filmed piece of footage which showed an understandably angry looking full-sized boa get attacked and slowly killed by Anthony's three Jack Russell dogs. "I was just driving along a side road when the snake started crawling out of the engine and onto the bonnet," Anthony told me. "It was crazy. I pulled over, kicked the snake off the car onto the ground and the dogs just went for it." A dead snake does, of course, mean that Anthony failed to claim his US$10. And as for the boa, it would appear that he was one of the unlucky ones. For despite the snake hunts, the reward money and the increasingly frenzied attempts by locals to rid Aruba of its new and unwanted visitors, the boas look likely to continue hitchhiking their way around the island for some time to come. "They're just good at adapting," Robert told me. "Far too good at it. We want everyone to love Aruba - but the boas are making themselves a little bit too much at home."